I know I recently posted a bit on what I still believe is a ridiculous commercial in praise of television, but I thought I'd pass along a recommendation for a good series. My wife and I are always game for a good detective show and so we were delightfully surprised when we discovered a British drama about a police detective in World War II Britain. The show is called Foyle's War and still being produced by ITV in the UK. They're now in series seven, with 22 episodes so far. My wife likes the murder mystery aspect. I enjoy the historical drama. All good fun. We're almost to the end of series one, so don't anyone spoil it if you've seen them. The wonderful thing about discovering a series late is that the public library has a good number of these on DVD. Thanks, Roger! I never trusted him, he just looked shifty. hahaha...it's the butler's second wife's lover who did it!! 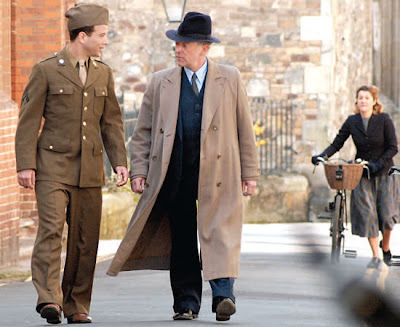 We also discovered Foyle's War late, but thoroughly enjoy the series for the same reasons you posted. Have you ever watched "Firefly"? We discovered the series after it was cancelled, and became big fans of the show and the premise. It's strange but I never heard of "Family at War". I can't say I'm a huge fan of classic detective movies and monitor new ones constantly but I checked it on essay writing service ratings and this one looks good. Thanks for the tip!